My son has always loved for us to read to him, we spend at least a half hour or more reading to him every night. He has not been as enthusiastic about reading on his own though. Fortunately, or maybe unfortunately, video games have helped with this. He just got a new Kingdom Hearts game and there is a lot of reading in it because much of the game is a story. This evening, Mom was helping Jeffrey read the story on his game. With four adults in the house, it is nice to be able to work as a family to care for each other. While the rest of us were busy cleaning up from dinner, Mom was able to be there for Jeffrey and help him read. 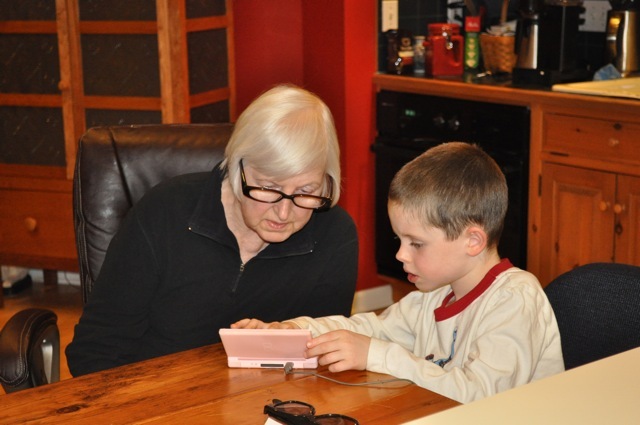 Many of us assume that there is a gap in the generations, thinking that a seventy-three year old woman can’t communicate with a six year old boy around a video game, but they were able to. It was also interesting to see how Mom helped Jeffrey have more patience and gain confidence is his reading ability. He can get a bit frustrated with reading and if he can’t read the word right away, he asks us for help. The words on the screen were very small and Mom has some difficulty with her eyes, so it took her longer to read the words. This slowed Jeffrey down and he was able to read more complex words by going at Mom’s pace. It is always amazing to me how simple things in every day life provide such learning and create bonding of relationships when we take the time to do them together.